SCOTCH whisky began 2017 strongly, as high demand across the world caused the value of exports to rise sharply, writes Leon Kuebler for WhiskyInvestDirect. 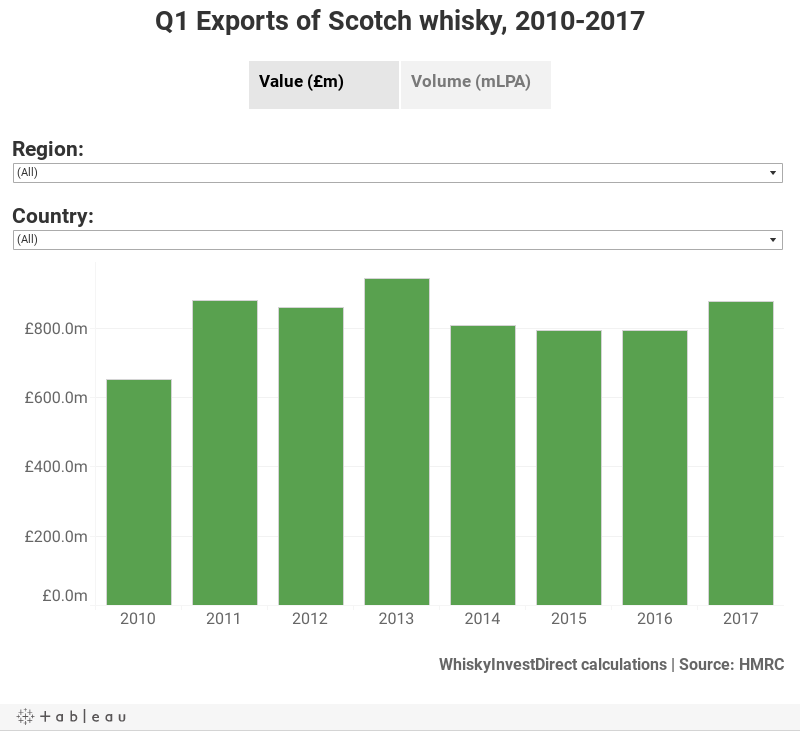 The heightened level of global demand, combined with the continued weakness of the Pound, caused exports of Scotch to reach their highest levels since 2013. Official figures released by HMRC showed that over £112 worth of Scotch was shipped overseas every second between January and March of 2017, worth a total of £875.2m. This was a huge 10.4% increase on Q1 of 2016 – amounting to an extra £920,000 earned from Scotch whisky exports every day. The physical amount of Scotch shipped abroad also went up compared to last year. In total, some 21.6m twelve-bottle cases worth of Scotch left the United Kingdom in Jan-Mar 2017 – 3.4% more than this time last year. These numbers suggest that the improvement in Scotch whisky exports seen in 2016 (as first reported on by WhiskyInvestDirect) has continued into this year. As in 2016, two main factors likely contributed to Scotch's strong performance: the continued weakness of the Pound; and the high level of demand for Scotch whisky worldwide. Scotch is a truly global drink, and its popularity remains strong across the planet. Every region of the world spent more Pounds on Scotch whisky in Q1 2017 than in the same period of last year. Double-digit rises were seen in Scotch's two largest markets, the European Union (up 10.3%) and North America (+14.4%). The increased level of spending which Scotch is experiencing overseas is partly an indirect short-term consequence of last year's UK vote to leave the European Union. Since the result of the June 23rd 'Brexit' referendum was announced, the value of the Pound weakened severely compared to its pre-referendum levels. The Pound has continued to remain weak this year. According to the Bank of England's Broad Exchange Rate Index (ERI), which measures the strength of Sterling against a wide basket of foreign currencies, in 2017 Q1 the Pound reached its lowest value in twenty-one years. Last year's weakness in the Pound meant that British-made products, such as Scotch, effectively became cheaper to overseas importers. This helps to explain why exports performed particularly strongly after the referendum, in Q3 and Q4 of 2016, whereas they had dropped slightly before. Based on these first quarter 2017 figures, Scotch whisky could well be in for another good year –although sustained double-digit growth throughout the whole of 2017 may prove difficult. The reason is simple: most Scotch is normally exported in the second half of the year, at which point over a year will have passed since the Pound's devaluation post-referendum. From Q3 onwards, this event will no longer affect the year-on-year results. Should the Pound remain at the current level (against the Dollar, it is currently trading at a rate not much below that of Q3 2016), the strength of Sterling will have far less of an impact on the year-on-year numbers for Q3 and Q4 of 2017. None of this should hide the fact that the Q1 has been excellent for Scotch, however. And with Sterling still weak compared to Q2 2016, the next quarterly figures for 2017 are also likely to be eye-catching. In 2016, exports of single malt Scotch topped £1bn for the first time. They began the first three months of the year in a similar fashion, growing by 15% in value and 11% in volume on Q1 2016 to reach £233.2m. Yet bottled blended Scotch (69% of all exports by volume last year) also increased by 2.5% in volume and 9.9% in value, with a total worth of £591.1m – the best figure since 2013. Most currencies strengthened against the Pound last year – but not all. The Mexican Peso hit a record low at the time of Donald Trump's inauguration as President of the United States, due to fears concerning the potential impact of his proposed tariffs on imports and border wall. This helps to partially explain why Scotch exports to Mexico, one of Scotch's biggest success stories over the last decade, were down by so much so heavily on last year. Is Scotch returning to Russia? The EU sanctions imposed on Russia in 2014 mean that direct imports remain tiny, worth only £0.8m over three months in 2017. But shipments to Estonia and Latvia, the countries through which most Scotch reaches Russia, rose by an astonishing 64.5% by value and 80.2% in volume on last year. Combined together, 2.4m LPA of Scotch were sent to these three countries in Q1 of 2017 – a significantly better first quarter than has been seen at any point since 2011. Latvia's gain was Estonia's loss, however. Q1 exports to Estonia were worth less than £0.5m – twenty-times less than just three years ago. By contrast, Latvia imported over 2m LPA of Scotch: the equivalent of over 571,000 bottles at 40% ABV. If exports continued at this rate for the rest of 2017, over 2.3m bottles would reach Latvia – which would mean that, in just one year, this country of 2.2m people would have more bottles of whisky than it would have residents. For more background and analysis of the growing Scotch whisky market, see our Whisky News pages here.